ROWING IS A COMPETITIVE SPORT AND THERE IS NO SHORTAGE OF OPPORTUNITIES FOR OUR CREWS TO COMPETE AND REPRESENT TAKAPUNA GRAMMAR SCHOOL. 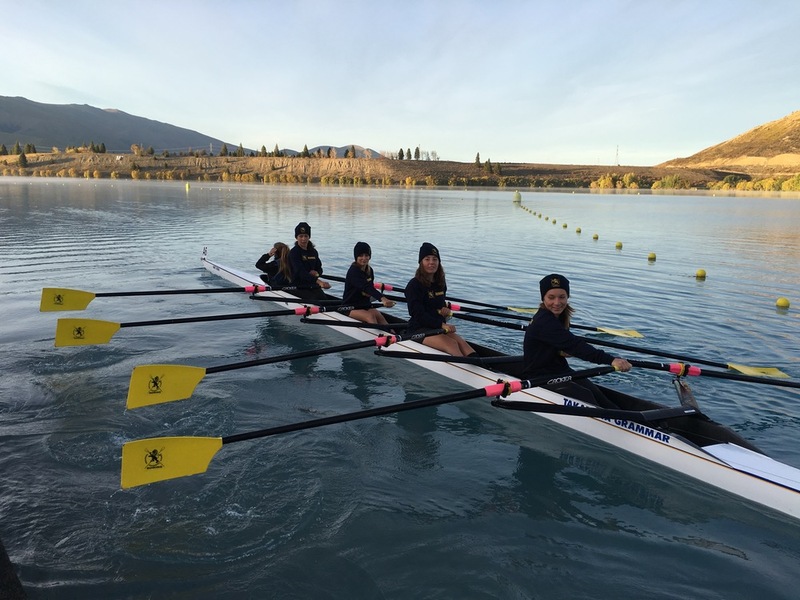 During the season, the Club will compete in approximately 10 regattas, culminating in the North Island Secondary Schools (NISS) Championships and the Maadi Cup. Competition at all levels is fierce and this provides an excellent development platform for young rowers, in both areas ability and sportsmanship. Rowing competitions are called 'Regattas’. Takapuna Grammar School Rowing Club provides all rowers with a chance to compete at regattas, although not all rowers attend every regatta. Some regattas are designed for seniors, some for novices, and others for all levels of rowers. Parents are encouraged to attend the events to support the rowers, with helpers required for transport, catering, boat maintenance and general organising activities. We have a lot of fun supporting our rowers. Bring your own picnic lunch, binoculars, camera, chairs, and some reading material is always good to have as there can be lengthy down times between races. Our Takapuna Grammar School Rowing Club tent is our home base and a meeting place to catch up with all other club members, there are some chairs provided at tent for you to sit back, relax and enjoy. Our tent is also used as a base to cater for the rowers (and parent volunteers are also needed for this). Crew members will also have a tent or other shelter in the boat park from where they make their final preparations for each race and go through their debrief and immediate post-race nutrition routines. The boat park is equivalent to the dressing room in other sporting codes. It is the place for the rowers to focus on their racing and it is not a place for parents to visit. Accordingly, parents are asked not to visit the boat park during regattas. Once the races are finished, boats and equipment must be loaded onto the trailer. All rowers are expected to stay for any awards ceremony. A roster will determine which rowers will be needed to ensure the boat loading is undertaken quickly and efficiently.